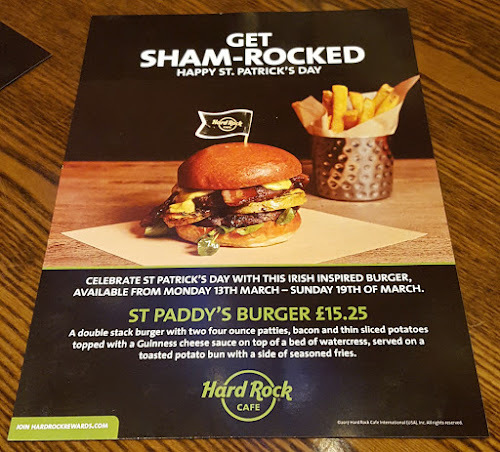 I'll start this quick review by saying that prior to Monday evening, I have never been inside any of the many Hard Rock Cafe locations across the globe and also add that I'm not a huge fan of St Patrick's Day (or any patron saint) being used as a commercial vehicle. 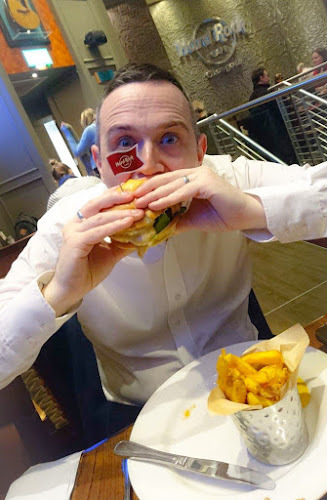 However, when I was invited along to try the St Paddy's Burger at Hard Rock Cafe Glasgow earlier this week, I jumped at the chance of getting along to see what I've been missing. Myself and Nicola have walked by a number of Hard Rock Cafe venues on our travels and never been tempted to try them out. This is mostly down to the fact that despite the fact that Hard Rock Cafe have been trading for over 45 years, every time I see a review from friends or family who have eaten at Hard Rock Cafe, almost all of the feedback points towards overpriced food and drink coupled with mediocre service. Obviously, I can't comment on all the worldwide locations but our experience on Monday evening in Glasgow was anything but! St Patrick's Day is celebrated on 17th February and whilst the day is a tipping of hat towards the 'traditional death date' of Saint Patrick, it is a day that has become more commercialised as Irish brands use the day to promote their products. Getting in on the St Patrick's Day act, Hard Rock Cafe launched the St Paddy's Burger (which will be served all week until Sunday 19th March), a double stack burger with two 4oz beef patties, bacon and thin sliced potatoes topped with a Guinness cheese sauce on top of bed of watercress, served on a toasted potato bun with a side of seasoned fries. Monday night is traditionally the quietest night of the week for restaurant bookings so it was no surprise that the restaurant wasn't that busy when we arrived just after 5pm on Monday evening. With the restaurant fairly empty (although it did get busier as the night rolled on), we were able to take in and appreciate some of the rock and pop memorabilia that adorns the wall of Hard Rock Cafe Glasgow including one of Bob Dylan's guitars, Amy MacDonald's coat, Angus Young's AC/DC school boy outfit and a snakeskin blazer once owned by the legend that is Keith Richards. 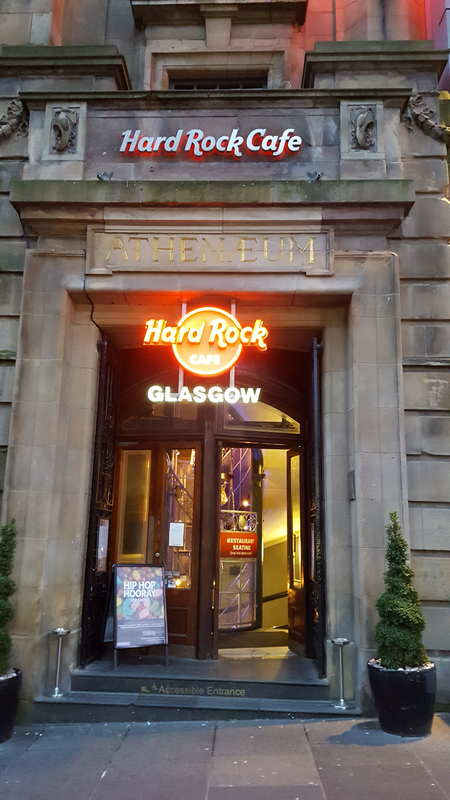 Hard Rock Cafe is housed inside what was The Glasgow Old Atheneum, a stunning building which dates back to 1893, and although the building no longer plays host to plays by the top actors of the modern day, at least the venue does still hold some of the original charm of the past. Anyway, enough about the surroundings, we were there to check out the St Paddy's Burger. Our server on the night was John, an excitable chap from the north of England who has been working in the Glasgow Hard Rock Cafe for the last few years. If we were expecting mediocre service, we couldn't have been more wrong. John was charming and a credit to his profession. It's rare to see a waiter/server have so much passion for their job but John's attitude was infectious and we knew that even if the food wasn't up to scratch, the service might make up for it. When the St Paddy's Burger arrived it looked exactly like the picture. How many burger joints can do that? 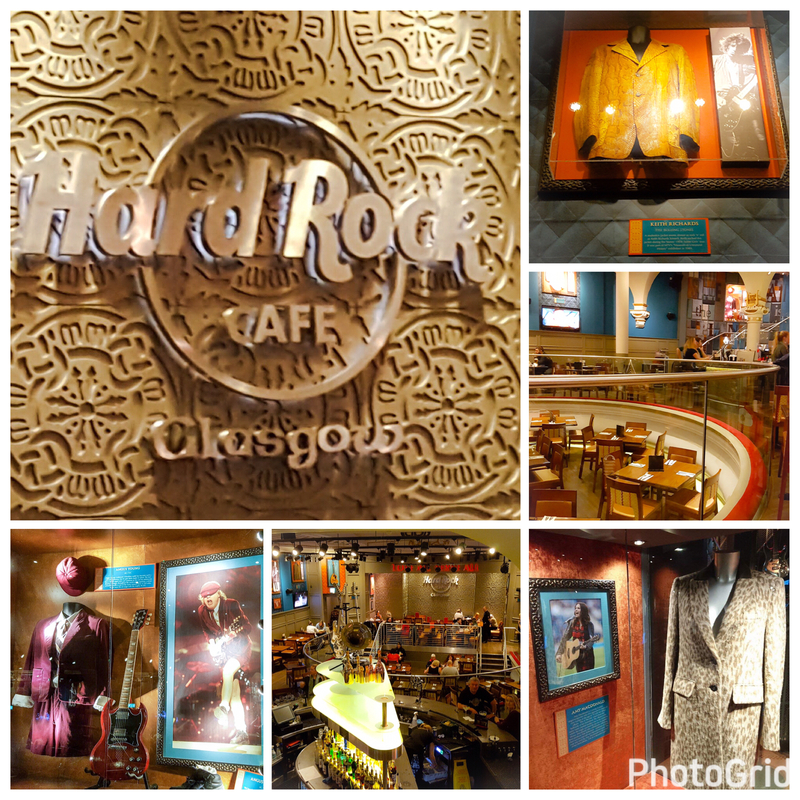 We both enjoyed our first meal at Hard Rock Cafe Glasgow but did our first visit prove the critics right? Was the food and drink overpriced? I don't think so. The St Paddy's burger & fries cost more than I would normally pay for a burger but when you're sitting in a venue surrounded by pieces of rock and pop history, is £15.25 too much to pay? I don't think so. The food was freshly cooked and well presented, and I would happily eat there again. Was the service mediocre? Absolutely not! We were looked after very well by John and a couple of his colleagues. They might have known that we were in to review the St Paddy's Burger but I believe that the service we received is business as usual. We were invite to Hard Rock Cafe Glasgow in return for a review but the review above is an honest account of our evening. I would like to thank the management and staff for their hospitality and generosity and I look forward to getting back again soon. 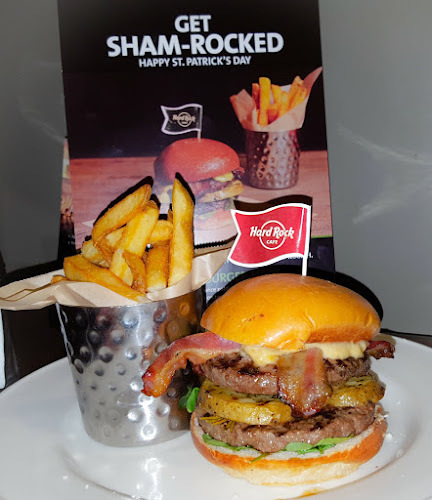 As mentioned previously, the St Paddy's burger is being served until Sunday 19th March so there's plenty of time to celebrate St Patrick's weekend so head along to Hard Rock Cafe Glasgow and 'Get Sham-Rocked'?